First off, for you fans of Beautiful Creatures by the amazing duo of Kami Garcia and Margaret Stohl, you will be happy to hear that there is now officially a title for BC 2--Beautiful Darkness! Exciting! You can check out this Beautiful Creatures Ning page for more things BC, and stop by next Friday, on March 19th, for the official reveal of the Beautiful Darkness cover! Second, this interesting article popped up on the "Huffington Post" website yesterday...it seems that Hillary Duff is now going to add YA author to her list of accomplishments with her new YA series beginning with Elixir. I don't know much else about it, except that Simon and Schuster will publish it in October. Now, I don't want to be a downer, but I can't help but wonder and this...and be slightly perturbed by it. Is HD a good writer? Or will her book join ranks with Lauren Conrad's, hitting the New York Times Bestseller list when in reality, it's just not that good? Who knows. Only time will tell. And finally, check out this awesome blog post where you can have the chance to win a $25 Barnes and Noble giftcard by answering a question about Julia Hoban's book, Willow (which is now out in paperback!). And while you are at it, listen to her radio interview! Clea Raymond is a talented young photojournalist who has spent her entire life in the spotlight as the daughter of a Washington politician and a renowned surgeon. Haunted by the strange appearance of a mysterious young man in her photographs, Clea travels the globe with her best friends, Rayna and Ben, in a race against time to unravel a centuries-old mystery that could unlock the key to her soulmate's true identity and the secret of her father's disappearance--and ultimately save all their lives. Exciting news about Beautiful Darkness. 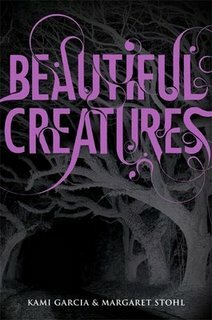 I recently read Beautiful Creatures and I loved it. I can't wait to see the cover and find out more. Thanks for sharing!